Correction of Spelling and Grammar Mistakes in Article "How to Scheduled Transfer from One Bank to Other with Net Banking Account?" 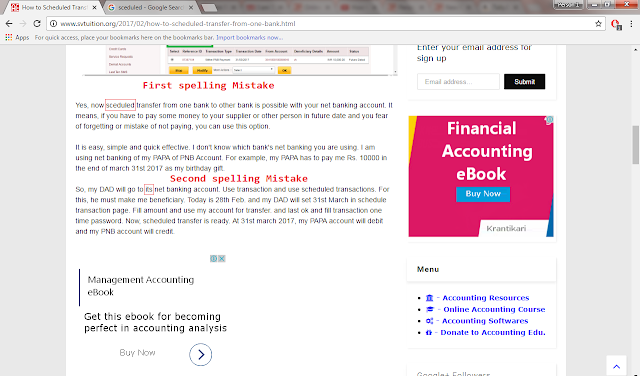 Today, Vikas Kumar ( Accounting Education Volunteer and Editor) has found two spelling and grammar mistake in our article "How to Scheduled Transfer from One Bank to Other with Net Banking Account?" If you have found any spelling or grammar mistake on the website Accounting Education ( http://www.svtuition.org ) , please tell us at our email vinod@svtuition.org or whatsapp +91-9356234925 and get big reward from us. Education : Correction of Spelling and Grammar Mistakes in Article "How to Scheduled Transfer from One Bank to Other with Net Banking Account?"